It consists of a white stone monument in the form of a wishing well, which contains six powerful lights that shine across it and are reflected into the sky with mirrors. Nine more lights shine upward, forming a column of light that changes in intensity and brilliance with the weather conditions. 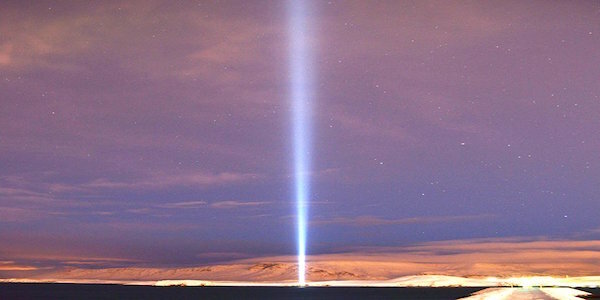 IMAGINE PEACE. به صلح بیندیش‎‎. TUFIKIRIENI AMANI. してごらん. HUGSA SÉR FRIÐ. 평화를 꿈꾸자. BARIŞI DÜŞLE. 想像世界有了和平. احلم سلام‎‎. ILARAWAN ANG MUNDONG MAPAYAPA. சமாதானத்தை நினையுங்கள். IMAGINE A PAZ. ПРЕДСТАВЬТЕ СЕБЕ МИР. KÉPZELD EL A BÉKÉT. शान्ति की कल्पना करें. KUVITTELE RAUHA. STELL DIR VOR ES IST FRIEDEN. წარმოიდგინეთ მშვიდობა. IMMAGINA LA PACE. ཞི་བ་སྒོམས་. IMAGINEZ LA PAIX. חלום שלום‎‎. ᓴᐃᒪᖃᑎᒌᑦᑕ. IMAGINA LA PAZ. 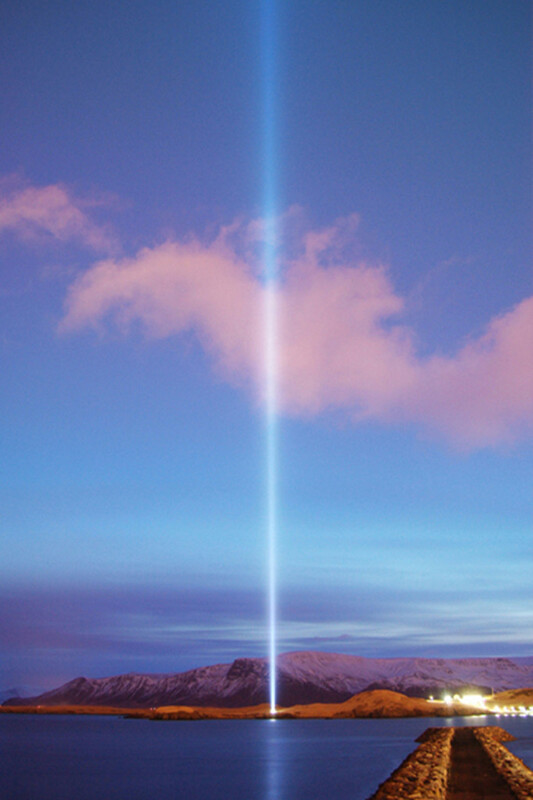 The Imagine Peace Tower was dedicated in 2007 and has been illuminated annually from October 9 (Lennon’s birthday) through December 8 (the anniversary of his death); from the Winter Solstice on December 21 through December 31; on Ono’s birthday on February 18; and during the first week of spring from March 20 through March 27. The lights use 75 kW of electricity, which is generated in Iceland from geothermal energy. More than a million written wishes are buried below the tower. They have been collected from various installations of Ono’s Wish Tree, a participatory and ongoing series in which a tree is planted and visitors are invited to tie written wishes to it. In addition to Ono’s Wish Trees, which have been planted in some two dozen installations since 1996, wishes may be mailed to the tower in Iceland, or submitted online by email or tweet. 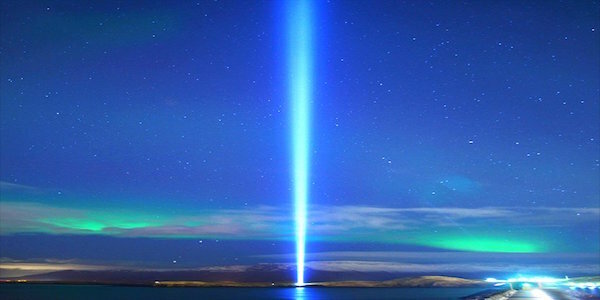 IMAGINE PEACE TOWER time lapse video – night of 19 Oct 2013. Think PEACE, Act PEACE, Spread PEACE. Shed light in darkness. 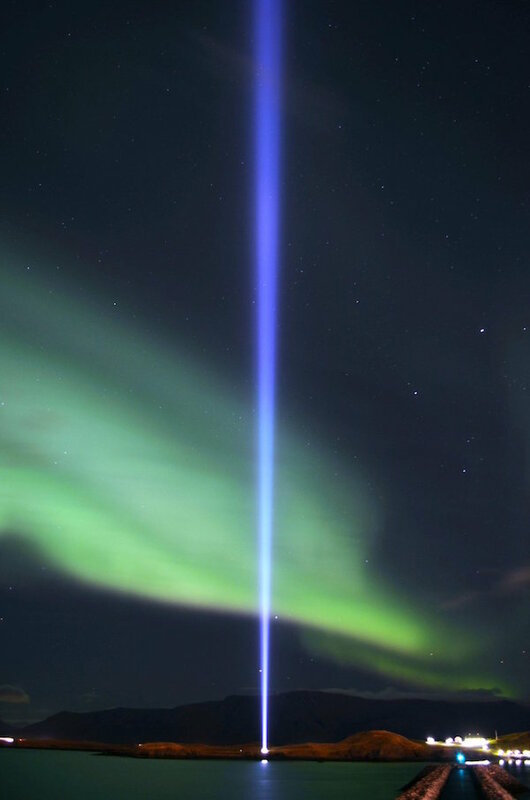 IMAGINE PEACE. All we are saying is Give Peace A Chance. All we are saying is Give Peace A Chance.